This page shows our display canoes, sometimes referred to as 'salesman's models' as historically small model canoes were used by travelling salesmen to represent the full size craft available. These are designed for display only and capture the spirit and beauty of the wooden canoe. Designed to be mounted on a wall, this beautiful craft has all the features of a true wooden canoe. It is built to the same exacting standards as our full-sized canoes. Made of cedar with cherry trim and carrying yoke it comes with hand-laced rawhide seats and cherry wall mounts. Finished with your choice of satin or gloss varnish. 58"L x 14"W x 7"D.
Our 9' Display Canoe makes a stunning presentation in any cabin, home, or showroom. Other than it's size and lack of a water-tight epoxy covering, this beautiful vessel actually is a real canoe! Built exclusively by American Traders with the same materials and by the same master craftsmen as our full-size canoes, this 9-foot "mini" is just the right size to hang over a mantle, from a beam, or anywhere! Cherry wall brackets are included to mount the canoe. An optional table stand is available. Your choice of red or white cedar planking with either satin or gloss marine varnish. 9'L x 20"W x 8"D. This item must ship via common carrier. Our 9' Birchbark Display Canoe is a classic statement of the true American spirit. The Native American Indian birch-bark canoe is faithfully built as they were 100's of years ago. Built exclusively for American Traders this canoe is in the Abeniki style and has beautiful lines and primitive decoration. Using bark from the birch tree, cedar and spruce root this display canoe is the perfect size to hang over a mantle or from a beam! Cherry wall brackets are included for wall mounting. 9'L x 20"W x 8"D. Normally made to order, please contact us for delivery time. This item must ship via common carrier. 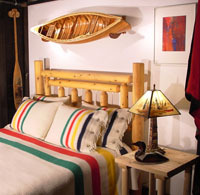 Our 9' Painted Display Canoe makes a stunning presentation in any cabin, home, or showroom. This beautiful scale canoe, often referred to as the salesman's model is actually a real canoe! Built exclusively by American Traders using the same materials and master craftsmen as our full-size canoes, this 9-foot "mini" is just the right size to hang over a mantle or from a beam! Cherry wall brackets are included for mounting the display canoe. Your choice of colors, green, white or blue are standard colors. Interior cedar planking with gloss marine varnish. 9'L x 20"W x 8"D. This item must ship via common carrier. One of our small capacity tandem canoes, the 12ft Trapper is perfect as a display piece. It's size and strong bow and stern recurve give it a traditional indian look and make it an ideal canoe to hang. Available in red or white cedar. This item must ship via common carrier. The 5ft Display canoe stand allows this canoe to be presented as a center-piece on a table or sideboard. The 9ft Display canoe stand allows this canoe to be shown as a center-piece on a table or sideboard.